Late last week, I was finally able to get my hands on an Apple Watch for hands on exploration of its accessibility features i have been reading about. 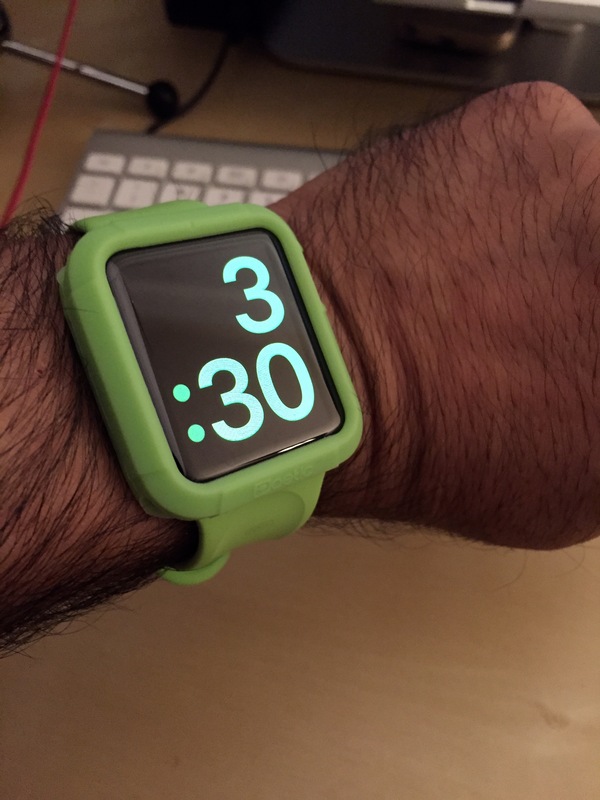 Right away, I customized the new watch with the extra-large watch face in a bright green to go along with the green sports band I am using for daily wear. I also got a bright green case since I know how often I walk into things due to my lack of peripheral vision. The case I got only cost about $5 on Amazon and is made by Poetic. It is a simple affair: a piece of rubber that goes around the watch and has openings for the sensors in the back and the Digital Crown and side button. In addition to my first Apple Watch accessibility video on Zoom (much of which I recorded while at my local Apple Store), I have now created three other videos focusing on VoiceOver and the other accessibility features built into Apple Watch. These videos are available on my YouTube channel as a separate playlist (I am still working on the captions but hope to have them ready by the end of the week). As for my early experiences with the device: I have been really enjoying the notifications that I get on my wrist with the Taptic Engine (I have Prominent Haptic turned on for even more of a tingle), and how I can quickly archive and dismiss emails with one touch once I glance at the watch. As someone who uses a white cane when out in public, not having to fumble around to get my phone out of my pocket when I get a notification will be really handy. Overcast for controlling podcast playback on my iPhone. American Airlines because I have some upcoming travel and want to test out use of the watch for check-in. Proloquo2Go (to test out the feature that uses the watch as a switch). Maybe the fact that I don’t have so many apps has helped me get pretty good battery life: as I write this at 9:30 PM, I have about 70% of my battery left. pinging my iPhone so that I can locate it by sound. As someone with poor vision (and sometimes equally bad memory) I tend to misplace my phone around the house quite often. This minor feature has already saved me quite a bit of time. 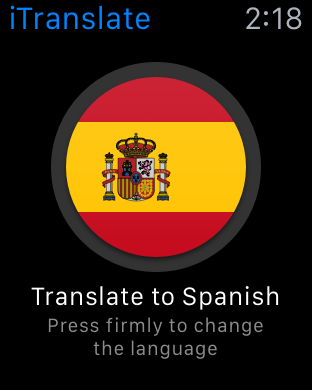 It would be so nice if a future Apple TV remote included support for this feature. That’s another item I frequently misplace (and sometimes lose forever, there’s currently one stuck inside my couch where I can’t get to it). being prompted to stand. For most people these are stand breaks, for me they are eye rest breaks. I do a lot of work on the computer and sometimes forget that I need to take regular breaks to avoid eye fatigue. The stand reminder is great for getting me out of my chair and getting me to focus my eyes on something other than the screen to give them a rest. remote shutter for Camera on iPhone. I recently learned that you can use the side button to trigger the shutter for the Camera on your iPhone from Apple Watch. This is supposed to work with any photography app that supports the volume buttons on iOS (which is the way I often take photos so that I have something tactile to work with), but so far I have only tried it with the built-in Camera app. The only other photography app I have installed on my Apple Watch was Pro Camera but it was very slow so I removed it. I look forward to continuing my Apple Watch journey over the next few weeks as I engage on quite a bit of travel. In fact, I am going to try an experiment. For the first time, I plan to travel without my Mac and will rely on only an iPad, my iPhone and Apple Watch for all of my computing needs (including accessibility). That includes presenting at a couple of conferences in addition to all of the travel-related uses of tech (checking in, getting transportation from Uber or Lyft, etc.). It should be an exciting experiment.